I was 11 years old when I was first introduced to Venus and Serena Williams. I was watching 60 Minutes with my mother, like all 11-year-olds do, and I saw a segment on them. They were 16 and 17 at the time, with a plethora of beads in their hair and mouths full of braces. They laughed often, wore oversized nondescript t-shirts, and obviously adored each other. I’d always wanted a sister, and I was jealous. Venus was the star at the time, already playing part-time on the WTA, but Serena was nipping right at her heels. Two months prior to their first match on the pro tour at the 1998 Australian Open, they were asked what it would be like to play each other. A giggly Serena answered, “Venus and I already discussed this, and I told her that it might be a different story on the court, but I’m going to try really hard. 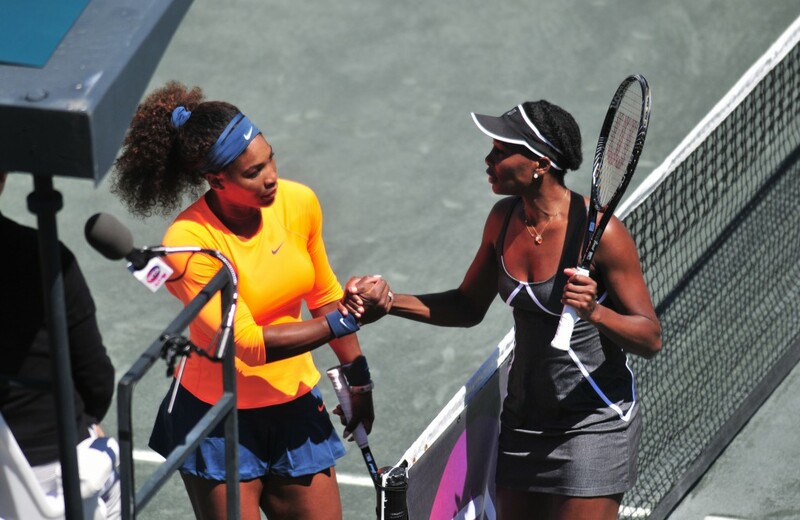 I’m not going to go out there and just let her win.” As Serena talked, Venus stroked her little sister’s hair. 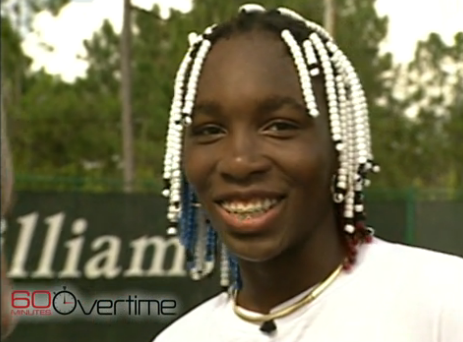 I wasn’t a tennis fan at the time, but that was the exact moment I fell in love with Venus Williams. I don’t cry often about tennis. I think Andy Roddick’s abrupt retirement dried up my tennis tears. I wasn’t expecting to cry. It wasn’t on my to-do list. I had run to the car to grab my winter coat right after play at the Family Circle Cup had begun, because it was absolutely freezing. (I had kept the big jacket in the car out of pure denial, but had finally reached the point where I knew it was my only hope to get to watch matches outside of the comfort of the heated media center. I’m a bit of a wuss.) On my way back from the parking lot, I stopped by Althea Gibson to watch a little bit of Bethanie Mattek-Sands and Madison Keys. Sure, I was interested in that match, but I was also avoiding the happenings on Stadium. I was afraid that Venus was going to come out flat, and I was afraid to check the scores to see if I was right. But with Keys up 5-1, I garnered the courage to peak at my phone. Venus was up a break. I ran over to Billie Jean King court and perched in the media seats. I pulled out my moleskine notebook, where I typically take notes on points, scores, and observations during matches. I sat back in my flimsy chair and watched as Venus Williams, one of my favorite athletes in the world, took the first set 6-2 over Varvara Lepchenko with a relative fleet of forehand and backhand winners. I didn’t write a single note. As I listened to the half-packed crowd cheer their hearts out for the veteran Venus so early on the uncomfortably cold day, I found myself completely overwhelmed with emotion. For me, watching Venus Williams play live isn’t just about the tennis. For me, watching Venus Williams play live is about the joy she felt when she reached her first major final at the US Open in 1997. It’s about the class she showed when she was defeated in four straight major finals by her younger sister from 2002-2003. It’s about her epic battle with Davenport in the 2005 Wimbledon final that I “watched” on live scores while working a terrible job as a reservationist for a hotel the summer between my freshmen and sophomore year of college. It’s about how I had to spend part of my lunch break that day letting out my joy in the parking lot, likely scaring away guests. For me, watching Venus Williams play live is about her fight for equal prize money, and the fearless leadership she’s provided to women’s tennis. For me, watching Venus Williams play live is about the heartbreaks. There have been many, but the collapse in the second set tiebreak against Kim Clijsters in the 2010 US Open semifinal stands out. You know the one. For me, watching Venus Williams play live is about Sjogren’s Syndrome. It’s about the fact that she’s able to play two matches in a day a year after she was barely able to get through one. It’s about the fact that she has had the strength to manage a disease that has affected so many and still be a professional tennis player. It’s about having the strength to have no excuses. For me, watching Venus Williams play live is about the fact that I didn’t know if I’d ever get the chance to. When she withdrew before her second round match against Sabine Lisicki at the 2011 US Open, I didn’t think I’d ever get to see her play again. I thought that was it. For me, watching Venus Williams play live is about feeling guilty for ever doubting her. It’s about her gold medal in doubles last year, her title in Luxembourg, and her top 20 ranking at the age of 32. It’s about the fact that she’s still out there, that she still cares, that she still loves this game as much as she did when she was a child. For me, watching Venus Williams isn’t about forehands and backhands, points, or games. It’s about perseverance, survival, and inspiration. For me, it’s personal. And so as I watched her battle Varvara Lepchenko yesterday morning, I betrayed my media credential, pulled down my sunglasses, and for just a moment, I cried. Today, in front of a packed crowd in the Charleston semifinals, Serena and Venus squared off for the 24th time in their illustrious careers. It was the first time they have played since the end of 2009. Because of everything they’ve been through in the past few years, this match was different. The last years have been challenging and at some points difficult, but I think in both of our heads we never gave up on tennis, or ourselves, or belief. And that’s what’s crucial is that you never stop believing in yourself. And it’s not easy, but it’s worth it. A lot has happened the past few years in my life, too. 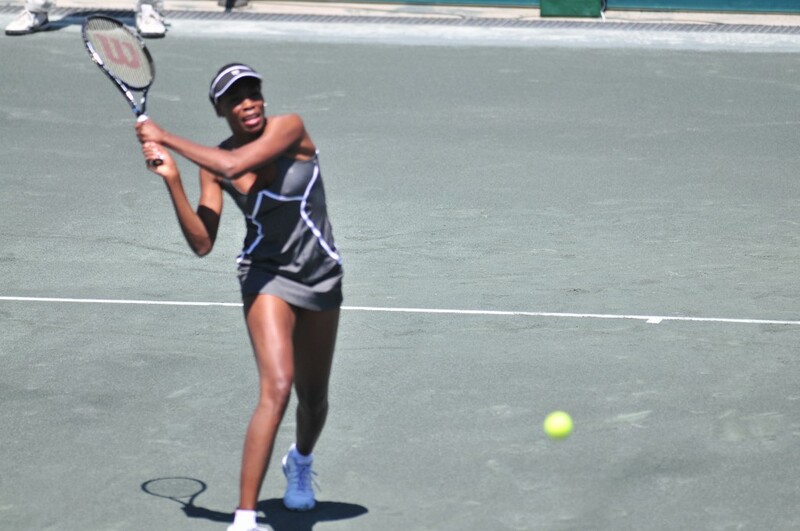 Watching Serena and Venus square off today, I thought about how lucky I am to have gotten through so much and to be here in Charleston, watching one of my idols and writing about tennis. Life isn’t perfect by any means, but that only serves to make the sweet moments that much sweeter. Often times meeting someone you’ve looked up to your entire life can be disappointing. Being in press with Venus this week has been the opposite. She doesn’t talk down to anyone. She smiles like she means it. She’s soft-spoken, personable, and warm. She sometimes strolls in the front door of the media center, sans entourage, while most players are go-carted around to the side door. She’s patient, she’s smart, and if she feels sorry for herself, she doesn’t let on. Venus Williams has seven Grand Slams, 44 titles, and has been No. 1 in the world. Any way you stack the numbers, her career has been a massive success. And to add to all of that, while dealing with an autoimmune disease that compromises the quality of life of mere mortals, she is currently the No. 24-ranked tennis player in the world. In press yesterday, I asked her about that 60 Minutes interview she’d given when she was 17. I told her what she said then, about how she questioned whether she had killer instinct. Though she didn’t remember the interview, she smiled and laughed. Haha i think your love for venus might be messing up your math. Pretty sure she has 7 (singles) slams. Beautifully typed, Lindsay. I wasn’t watching tennis at that time, but I respect and adore Venus so much. I just wish people would stop talking about how she should retire soon because she isn’t winning Slams anymore; she’s not retiring anytime soon for the same reasons Lleyton Hewitt isn’t retiring anytime soon, and we should be happy she isn’t. That was really well written it actually brought tears to my eyes. I have loved Venus for a long time, and so I definitely related to this article. Again, I love your honesty and the personal touch you add to everything you write. Great one, Lindsay. To me the ineffable Venus moment was her reaction after losing the French Open final to Serena in 2002, a tournament she had not won, and probably never will win. She hadn’t played very well, and probably deep down inside she knew that day, that forever after she would live in the shadow of her even more gloriously talented sister. Me, I would have been disconsolate for a month. But here is Venus, as happy for her sister as she would have been for herself. Really appreciated this article. I am going to watch the Venus and Serena documentary this coming weekend, and reading this just got me even more into the mood for it. I’m sure if Venus read this article, she would think “I need to do more. This isn’t enough.” That’s the amazing person that she is, and it will be a sad day for tennis when she leaves, but I think we all know that that won’t be any time soon. I was lucky enough to watch Venus play her opening round match at Eastbourne two years ago and loved every second. The people sat to my left commented on my enthusiasm (oops!) and jokingly said they would cheer for Andrea to add some balance. Poor folks then received a very long and detailed reason why no, they really must join me in supporting Venus. This was post Oz open and that awful injury she sustained -I may have over done it but they joined me. They never offered me a glass of their champagne though, probably thought I was already pissed! Oh Linds, stop making me bawl. People talk about Venus’ perseverance by continuing to fight and win tennis matches despite having an auto-immune disease. What is even more remarkable is that during all of this she has maintained 2 successful businesses and is every day getting endorsements for other businesses. Long before Federer had his RF logo, Venus had her own interior decorating business. She is, and has always been a savvy business woman. When she came out with her clothing line, a lot of her designs were mocked by tennis fans and non-tennis fans. She was ridiculed for her ideas and to her credit she kept coming back, bigger and better. When Steve & Barry went bust, she never gave up hopes for her own clothing lines. Now a few short years later, she is back and now WTA players are wearing her tennis line. That is perseverance. At a time when so many people have to team up with a big conglomerate to make it work, Venus launched her fashion line at New York Fashion Week to rave reviews. And to put the icing on the cake, she has a really hot boyfriend. Fantastic piece, Lindsay. To me, Serena has always been the more compelling personality but you make me appreciate Venus on so many levels, here. And your own fandom is vividly conveyed — it’s interesting and not mawkish, tears and all. Bravo! I love it Linz. As fellow Vee fans would know it, we cherish Vee’s achievements, adore them, glorify them, but part of it was following Vee’s troubles and disappointments. Whatever happens to Vee, we still love her. That 2010 Vee loss against Kimmy, sure was heartbreaking, she had hit all good smashes before that tiebreaker, and then suddenly no one smash went inside the lines. But still we love Vee. And her illness, her return to court, gives us more determination and inspires us. Who doesn’t love Vee? Lovely piece Linz. Cried a bit too. Remembering Vee does that.